A comforting, tasty dish that's packed with vegetables. The smashed avocado, pea and feta topping works just as well on a regular baked potato or piled onto rye or sourdough bread. Try serving with a fruity Marlborough sauvignon blanc. 1. Preheat the oven to 200°C, gas mark 6. Pierce the potatoes in several places with a fork and place on a baking tray. Bake for 1 hour until soft in the centre (test by gently squeezing the potatoes, though make sure your fingers are heat-protected). Put the sunfl ower seeds in a small roasting tin and add to the oven for the final 5 minutes. 2. Meanwhile, simmer the peas in a pan of boiling water for 3-4 minutes; drain. When the potatoes are nearly done, chop the avocado and put in a bowl with the peas. Crush together with the back of a fork. Add the herbs, Tabasco Green Pepper, a little seasoning and the lime juice, then combine. 3. Cut open the potatoes. 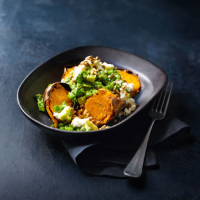 Divide the mashed avocado and peas between them, sprinkle over the feta and scatter with the roasted sunflower seeds. Add a splash more Tabasco, to serve. This recipe appeared within the February 2019 recipe card collection. This recipe was first published in Thu Jan 24 15:19:57 GMT 2019.